Creme de la Creme tm. 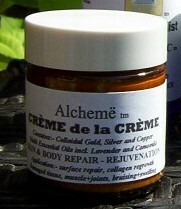 This is a cream made up of Colloidal GOLD, SILVER, COPPER, ZINC and ESSENTIAL OILS with additional trace elements** and although featured under our Alcheme Beauty range for its amazing properties for skin care, abrasions and rashes, it is also a great balm and healing aid for damaged muscles and sub-derma skin structure; any soft tissue damage, swollen or inflamed joint conditions and healing wounds. 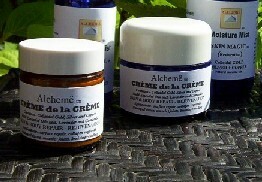 Creme de la Creme will also help readdress skin, bone and soft tissue damaged in a fall or heavy knock that has left severe bruising, lumps, bumps and broken skin. 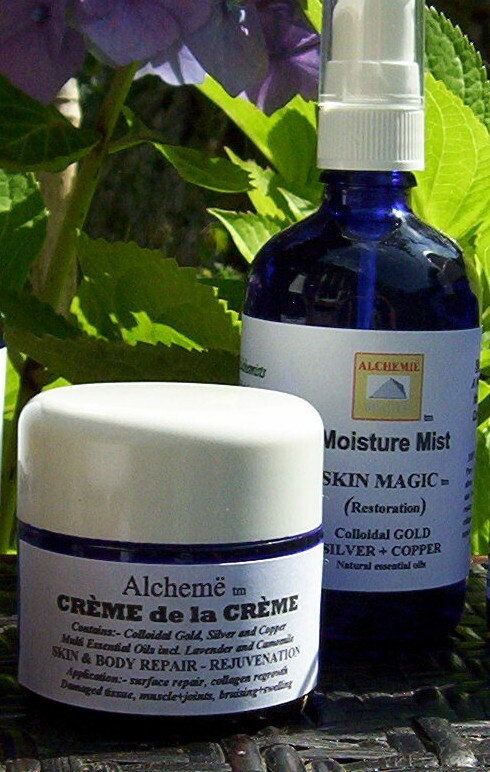 Success has also been achieved when using this cream to treat varicose veins, or as a general foot tonic when applied evenly all over the foot. ** Dead Sea Crystals, Aqua Lavender Water. Aqua Camomile Water, + Essential Oils of Naroli, Ylang Ylang, Damascene Rose. Lavender, purified seaweed, Dead Sea Crystals, Amino Acids, French Green Algae, Chlorophyll, Aloa Vera, and Grape seed extract..